This lovely member of the Heath family is a perennial dwarf evergreen shrub that rarely grows taller than 25cm. The stalked leathery strap-like leaves are alternate; they are dark green above and grey beneath. Pink long-stalked pitcher-shaped flowers are 5–8 mm long with fused petals, five sepals and ten stamens. Although scented and probably attractive to pollinating insects, this wildflower is self fertile; however, this plant is not reliant on its seeds: it is able to spread via its underground root system as well as via above-ground runners.. 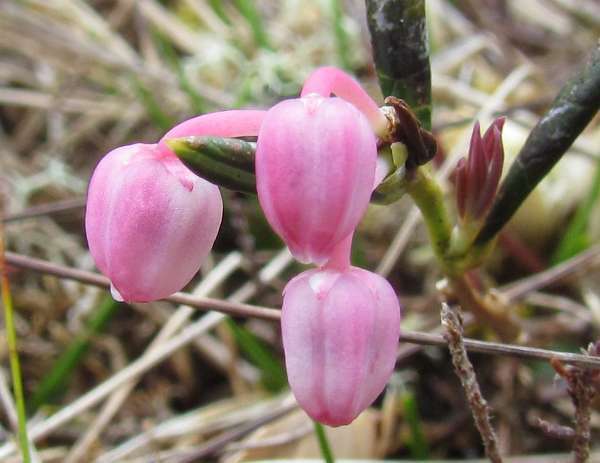 Bog Rosemary is found in many of the cooler parts of the northern hemisphere including Europe, Asia and North America. In Britain and Ireland this rare wildflower is in decline due to loss of suitable habitat. This is the county plant of Ceredigion, where it can be seen in peat bogs including Cors Caron, where we found the specimens shown here. Peat bogs in Galway (western Ireland) and parts of southern Scotland are also noted for the occurrence of Bog Rosemary. 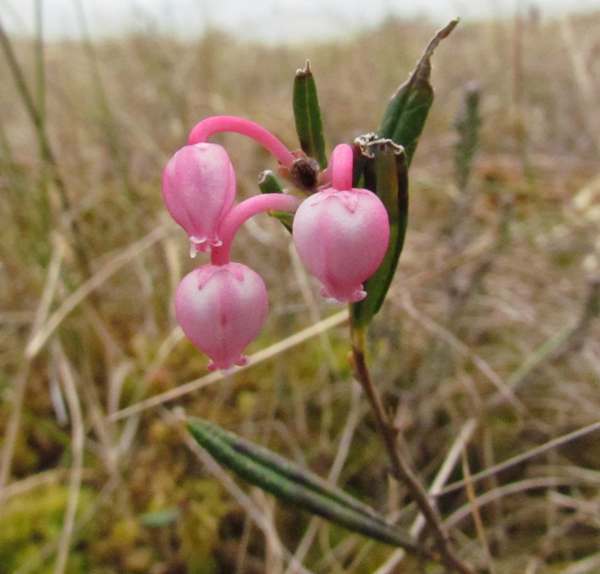 As its name suggests, Bog Rosemary is a flower of boggy and marshy land, but most particularly acidic peat bogs. In Britain and Ireland Bog Rosemary can usually be seen in flower during May and June. Andromeda, the generic name, was chosen by the famous Swedish naturalist Carl Linnaeus in 1732 when he first described this plant scientifically and gave it the binomial name Andromeda porifolia. (This is the only species within this genus.) In Greek mythology, Andromeda was the beautiful daughter of King Cepheus and Queen Cassiopeia of Aethiopia, in North Africa. The specific epithet porifolia means 'with grey leaves'. The common name Bog Rosemary arose because this plant grows in peat bogs and its leaves are superficially similar to those of the plant Rosemary Rosmarinus officinalis (a member of the unrelated family Lamiaceae).